The Zhuhai based Allwinner Technology Co. as the leader in the entry-level tablet space for the last 3 years is to continue its winning strategy with a new Cortex-A53 based quadcore solution. “In a few months you will definitely see devices” – told the company representative on the CES 2015 in an interview. Read also The Cortex-A53 as the Cortex-A7 replacement core is succeeding as a sweet-spot IP for various 64-bit high-volume market SoCs to be delivered from H2 CY14 on [‘Experiencing the Cloud’, Dec 23, 2013] post on my another blog. Supports the latest Trusted Firmware security architecture from ARMAs the first design house in China that have distributed Android 5.0 Lollipop to its tablet lineup, Allwinner Technology will keep the momentum and release Android 5.0 to Allwinner A64 when it comes out. It’s also worthy of notice that the Linux kernel that Allwinner A64’s based on upgrades to the latest 3.10 version, perfectly matching with the 64-bit architecture and Android 5.0 operating system. Allwinner is also one of the fastest vendors to support Android 5.0 Lollipop, having an engineering team dedicated to updating to the new version as soon as Google releases it. In order to appreciate the significance of that read also The roll-out of Google’s Material Design and the Android 5.0 Lollipop (Android L) [‘Experiencing the Cloud’, Nov 12, 2014] post on my another blog. The new A64 SoC will enable to play with the previous entry-level quadcore at somewhat even lower prices. Read the Launching the mass production of $4 Allwinner A33-based tablets for the $30 to $60 entry level segment of the market [this same blog, July 30, 2014] post in order to appreciate that. Note as well that accoprding to the company representative on the CES 2015 Android 5.0 Lollipop is already available for the 32-bit A-33. 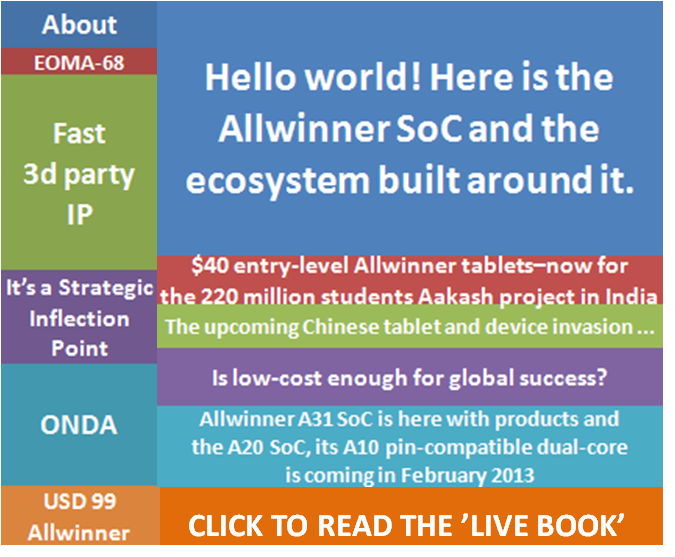 Today, Allwinner Technology unveiled its first 64-bit processor Allwinner A64 for tablet application. Priced at $5, Allwinner A64 definitely will be the most cost-efficient 64-bit tablet processor ever! As the first design house in China that have distributed Android 5.0 Lollipop to its tablet lineup, Allwinner Technology will keep the momentum and release Android 5.0 to Allwinner A64 when it comes out. It’s also worthy of notice that the Linux kernel that Allwinner A64’s based on upgrades to the latest 3.10 version of the Linux kernel, perfectly matching with the 64-bit architecture and Android 5.0 operating system. 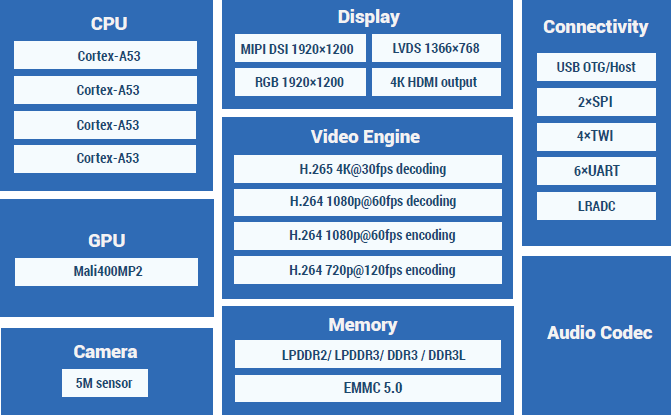 More details about Allwinner A64 are to be disclosed in the near future.